You Are Losing 41% of Your Leads! 7 Questions You Must Answer When Redesigning Your Site! 1- Is Your New Site Responsive? Your new site must be mobile-friendly. 57% of our clients’ patients are using mobile devices to access their sites (in plastic surgery field). If your site is not designed to accommodate mobile users, I guarantee that you’re losing business. The best mobile-friendly sites that do really well on the search engines are responsive sites. Adaptive and apps are not good solutions. An adaptive site is one that directs the browser to a different domain and shows a different site depending on the device used. Mobile apps need to be downloaded and are not good website replacement options. You can read about the pros and cons of these options here. 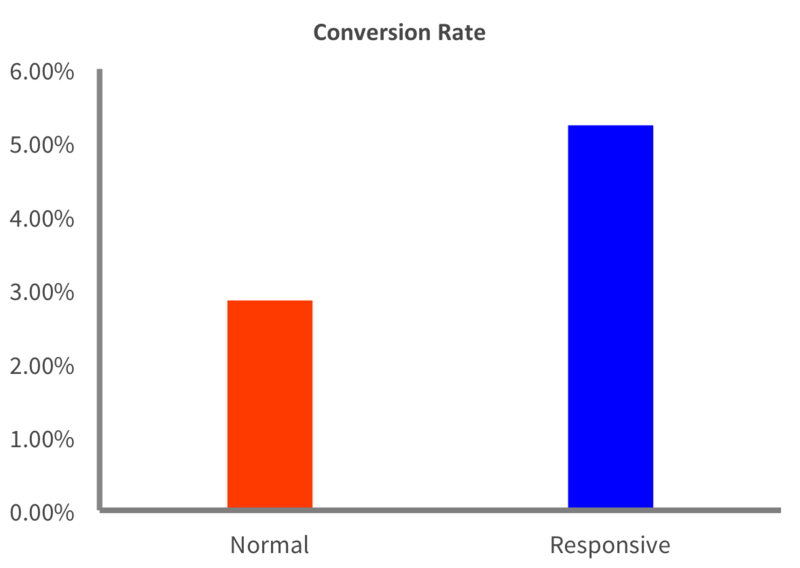 2- Do You Know Your Sites’ Conversion Rates? You have a site because you want your site visitors to contact you. If your site has 100 visitors and two of them call your office, your site has a two percent conversion rate. A new site should only increase your conversion rate. What’s the point of investing heavily in a new site and then realizing that its conversion rate just went down? So, to know if your new site is performing well or not, you should be monitoring your old site’s conversion rate as well as the new one and compare the two. That’s what we did for Associates In Plastic Surgery (AIPS). In the first ten days of launching the new site, the conversion rate almost doubled from 2.85% to 5.23%. This means the number of new leads doubled just by making the site mobile-friendly. This is explained by the fact that almost 60% of the site visitors are using mobile devices. 3- Does Your New Site Load Faster? Studies have shown that your audience’s attention span on the Internet was six seconds last year. Now, it could well be around four seconds. If your site takes more than four seconds to load, you’re losing a good chunk of your audience. Site speed becomes even more important on mobile devices, because mobile devices usually have a slower connection to the Internet. The Associates in Plastic Surgery site used to load within seven seconds before we rebuilt it. Once the site was finalized and we launched it, the new site took six seconds to load (which was okay given the site has lots of images and text). However, the problem was that on mobile devices (such as iPhones), it took nearly 12 seconds to load. This was unacceptable. We asked our developers to optimize the site further to make sure it loads efficiently. Within two days and lots of tweaking, they were able to bring the site’s load time to merely three seconds for the top of the fold section and four seconds for the entire site. That’s one reason the new site has a better conversion rate. 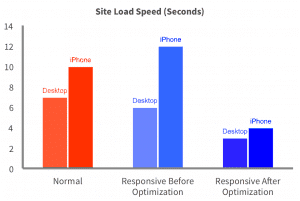 The load speed of the site also helps the SEO. One of the Google algorithm criteria is how quickly your site loads. Faster sites will rank higher on Google given everything else equally. 4- Does Your New Site Improve SEO and Traffic? The job of your SEO company is to increase the natural and targeted traffic to your site. A new site should not jeopardize SEO. If you have a new company design your site, make sure your SEO company optimizes the new site before it’s launched. However, the ranks and the traffic to the site may initially decrease if there is a major change in the structure of the site. As long as the SEO company is aware of the changes and takes the necessary steps, the ranks and the traffic will go back up. 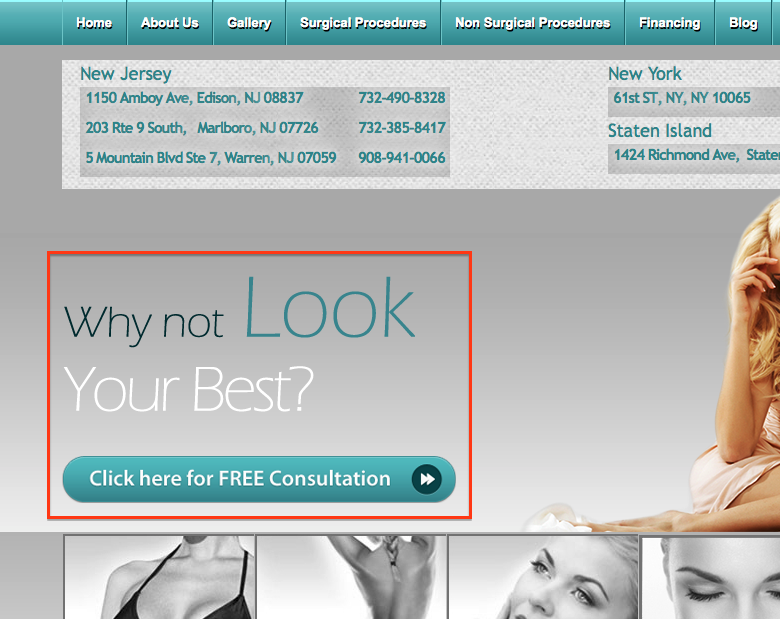 In the case of Associates in Plastic Surgery, we rebuilt the structure to make it more Google-friendly. Because of this major change, our traffic decreased in the first ten days by 9%. We expect this trend to reverse in the next few weeks. 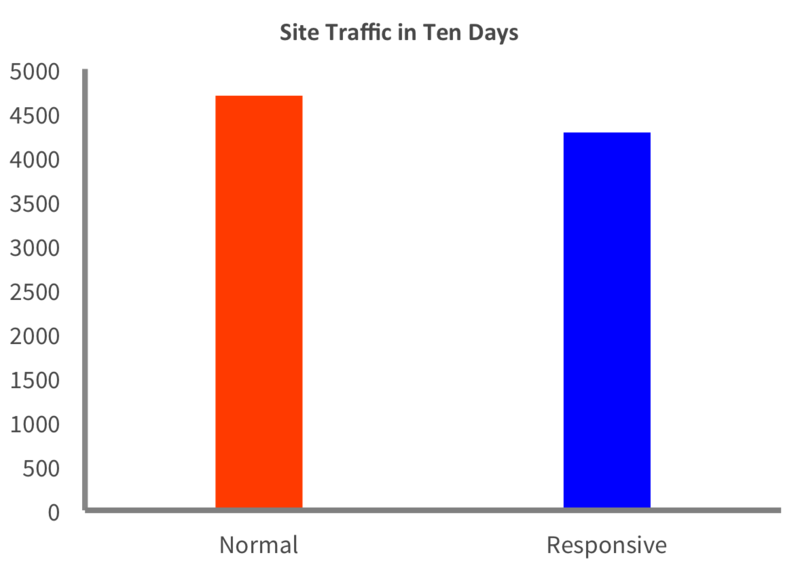 5- How Long Do Your Visitors Stay On the New Site? We said earlier that your visitors’ attention span has shrunk over the past few years to close to four seconds. But that’s not to be confused with how long they will stay on your site. Of course if within 5-6 seconds they’re not finding what they are looking for, they will leave. But once you grab their attention, they tend to stay longer and visit a few pages of your site. The longer you can entertain your audience and the more pages of your site they browse, the better it is. 6- Do You Have A Call to Action? If a site is lacking a strong call-to-action, it probably won’t have a good conversion rate. More than a decade ago, the first lesson I learned in designing websites at Page 1 Solutions was having a strong call-to-action. Dan Goldstein, the president of Page 1, would reject any site design that didn’t have one. That lesson holds strongly today as it did then, or maybe even stronger – because the audience now has a smaller span of attention and needs more direction as what to do. 7- How Many Goals Does Your Site Have? A site should not have many goals. In other words, you should know exactly what you want your site visitors to do. For the majority of the plastic surgeons, you want the site visitors to pick up the phone and call the office or fill out the form on your site. Have only one call to action through out your site. Whatever you want your audience do (which should be calling you or emailing you to set up an appointment). Thanks for reading the article and please make sure you leave your comments.